Audio to Score scans your music library in your smart device, analyzes the audio, and then produces a piano score, allowing you to learn how to play your favorite songs. Stream Lights show you which notes to play and when to play them, with four LED lights above each key. Lights move towards the keys to show the timing of the next note in the song. Tablet-based interface keeps the elegant, traditional look of a classic piano. All of the internal features are accessed via the touch screen of the user’s own iPad. 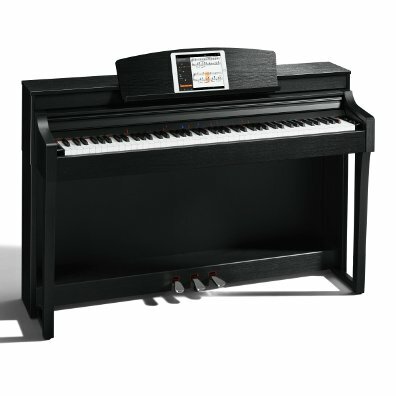 GH3X (Graded Hammer 3X) keyboard action with synthetic ebony & ivory keytops features three sensors and an escapement mechanism, creating a response and feel that is very much like that of a grand piano. 1/4″ microphone input allows you to connect a microphone so you can sing along while you play, hear your voice through the instrument’s speakers, and even record your performance to USB audio. VH2 (Vocal Harmony 2) with synth vocoder enhances your vocal performance by adding up to three virtual background singers, along with pitch correction, vocoder and other effects. Melody Suppressor isolates the melody of audio songs connected to the Aux Line Input jack and reduces the volume, allowing you to sing along or play the lead. 2-part Layer plus Split: play two Voices in the right hand and a different Voice in the left. Accompaniment Styles add a “backing band” to your performances while you remain in complete control of chord changes and arrangements. Registration Memories allow you to save and recall panel settings like Voice, Song, Pattern and/or Style to quickly access your favorite configurations. Audio time stretch and pitch shift allows you to change the key or tempo of your audio song playback to suit your needs. The Aux Line Input allows you to connect any music device with a headphone output, such as an MP3 player, a computer, a mixer, or even another instrument so you can hear it through the internal speakers.